The popularity of Xbox Game Pass among families could be how Microsoft closes the gap on Sony, suggests Newzoo in its latest piece of market analysis. According to the market intelligence firm, Xbox Game Pass is already more popular among family gamers, with 14 per cent paying a full subscription to the service compared to eight per cent of all gamers. The Newzoo Game Brand Tracker pulled data from France, Germany, the US, and UK; it found that of the households with children, 68 per cent play games together. In total, 29 per cent of the total population France, Germany, the US, and UK live in a household where children play games together. "But if the Xbox brand caters to the segment even more-with an all-in-one family plan, for example-it may start closing the gap between itself and console market leader PlayStation." Importantly, family gamers are likely to play a wider variety of game genres, typically avoiding only casino, puzzle, and casual games. Ready access to a selection of different games is one of the innate appeals of Xbox Game Pass and so serves this market segment well. 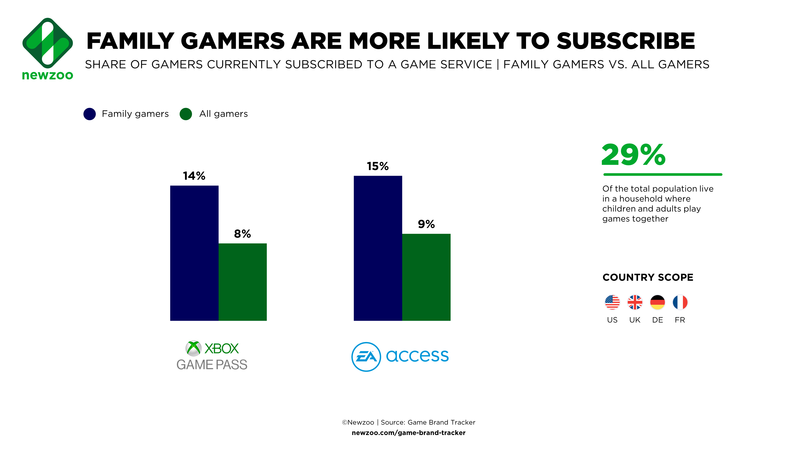 The popularity of subscription services among family gamers is also demonstrated with EA Access, which launched exclusively for Xbox One in 2014; it grants subscribers limited access to EA's catalogue, and has an adoption rate of 15 per cent among family gamers, compared to nine per cent of all gamers. Additionally, family gamers in the four regions are more likely to be subscribed to online gaming services; there is a significantly higher proportion of family gamers subscribed to both PlayStation Plus and Xbox Gold services (25 per cent and 23 per cent respectively), compared to all gamers (just 16 per cent and 15 per cent respectively). Given that music and video on-demand platforms have been providing family plans for years, and its something which Nintendo offered at launch with its Switch Online Service, Newzoo notes that similar options on Xbox Gold and PlayStation Plus "would be beneficial".